The largest and oldest global gastronomic society is known as the Chaîne des Rôtisseurs and Jamaica has a chapter that has been hosting some of the most legendary dining affairs across the island for over 30 years. 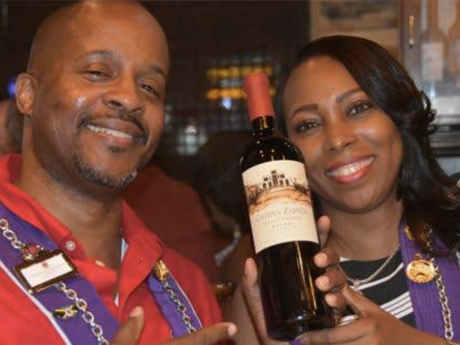 Hosting a dinner for members can be a daunting task, but wine shop-turned-wine bar-turned-full-fledged restaurant Uncorked took on the challenge this past weekend with a sold-out event titled “Uncorked Un-Chaine-D: The World of Wine Meets Jamaican Cuisine”. Our hosts Uncorked co-proprietor Anna Kay von Dueszeln; Debra Taylor, wine consultant; Katherine Evelyn, Uncorked group manager; Senior Sous-Chef Shanika McDonald and Chef Lucian Dunn promised a delightful and delicious wine and food pairing affair. The idea was that, for each course, a major wine-producing nation’s wine was paired with a dish from the same nation and made with popular Jamaican ingredients. The dish also had a most innovative Jamaican local name. Hosted on the heels of the exciting French win at the 2018 World Cup football finals, it was only fitting that cocktail hour commenced with Mumm Champagne. The Dish: Lobster Cocktail with Citrus Granita; The Wine: Cline Pinot Gris. Pinot Gris is the Italian name for Pinot Grigio but it’s usually made in a slightly different style. The Cline Pinot Gris was made in a medium- bodied crispy-clean style with some complex fruit on the nose and palate. The Dish: Rum Braised Goat Confit Crepe with Burnt Sugar Sauce and Coconut Pumpkin Puree; The Wine: Pascal Jolivet Sancerre Rouge. This wine from the Loire Valley is made with 100% Pinot Noir. This is a subtle, unsophisticated, very approachable medium-bodied red wine with a hint of spice. GERMANY: The Dish: Herring Kartoffelknodel in a pool of Callaloo Cream; The Wine: Dr L Riesling. “Dr L” embodies the elegant and racy style of Riesling from the steep, slate soil vineyards of the Mosel Valley. It is fruity and low in alcohol, with a refreshingly crisp taste that cools the palate, making it an excellent wine for foods with a bit of kick. The Dish: Hot to Cold Ginger Pumpkin Soup Shot; The Wine: Stone’s Original Ginger Wine. Made in Jamaica under licences, Stone’s Ginger Wine dates back to 1740 in London, where a company called The Finsbury Distilling Company created a product and named it after their most prominent customer, a grocer named Joseph Stone. Two hundred and seventy eight years later it is still made almost the same way — from fine-quality raisins and pure ground Jamaican ginger. Sales took off just around the time of the great cholera epidemic as it was believed that ginger offered protection against the disease. It has also been hailed as an aid to digestion and as an effective aphrodisiac — not much has changed. Cheese Platter with Homemade Breadfruit and Cassava Crackers serviced with Dow’s 10-year-old Tawny Port. Dow’s has been producing ports for over two centuries. Great with cheeses and desserts, Dow’s 10-year-old Tawny combines subtle fruit with delicious velvety nutty flavours derived from barrel ageing. The level of energy and laughter in the tight room suggested that a fantastic time was had by all.